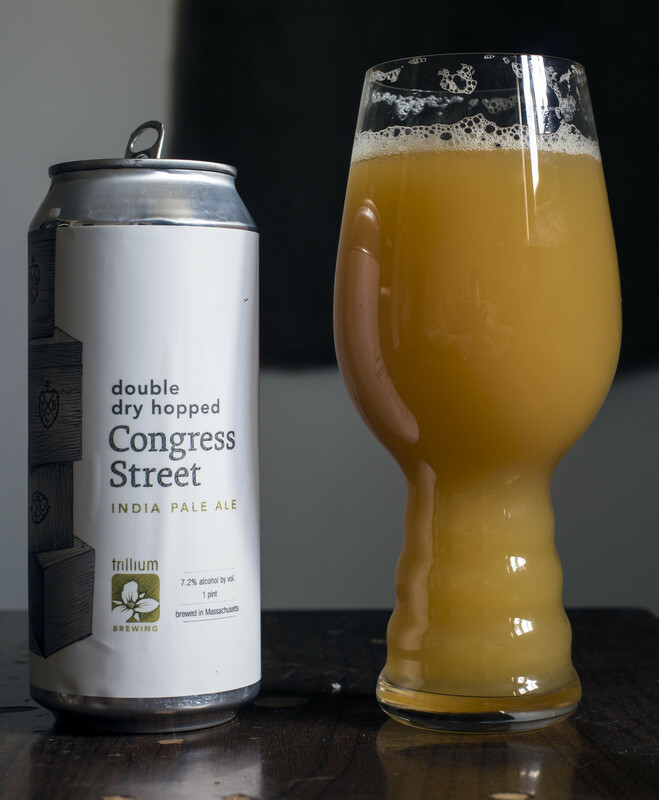 One thing I learned about Trillium Brewing the other day is that Trillium loves to promote the neighbourhood with their beers - almost every one of their beers is named after a street within a stone's throw from the brewery. Congress Street in Boston is right where the brewery is located. Pretty cool! Congress Street India Pale Ale is a double dry hopped IPA that tops out at 7.2% ABV. Congress Street is brewed with 2-row Barley, White Wheat, Galaxy and Columbus hops. Appearance: Congress Street pours like your typical orange juice with an almost smoothie-like creaminess to the body. The beer has a liberal amount of white head at the beginning but quickly diminishes to almost nothing at all.. aside from the lacing on the side of the glassware. Aroma: The smell I get right from the beginning is the aroma of fresh squeezed orange juice (sans pulp). It's sweet.. really sweet. It has notes OJ as well as pineapple, a bit of an herbal note from the hops that's slightly reminiscent of rosemary and fresh cut grass. Taste: The taste starts off with a mild bitterness from the Columbus hops as well as a hint of pepper. The taste then gives off that rich, sweet, tropical juiciness that we all know and love! I'm getting flavours of orange juice (sans pulp), pineapple, a hint of grapefruit for a bit of a bite to it. A slight hint of breadiness from the White Wheat. So tasty, sweet, juicy yet has a great bitter profile to it as well. Overall Thoughts: It won't be a while until I'll be having another New England IPA so I'm enjoying every drop while I still can! While I'm a hop head, I really like New England-style IPAs for being a great alternative to witbiers and other sweeter, heavy ales I love. Merci yet again to Corey for being awesome by bringing me this amazing mixture of beer! I owe you big time!